Like you, we understand that doing cannabis is so much more than getting the munchies and forgetting where you left your keys. Of course, that’s not to say we don’t know a thing or two about that as well. A dispensary for your lifestyle, Tetra offers high-quality products and accessories to complement your way of doing cannabis. Tetra wants to change the narrative regarding modern cannabis use — to push it toward a more accurate reflection of what doing cannabis actually looks like. It’s not reefer madness or peer pressure, and it’s not your brain on drugs. True cannabis culture represents a variety of lifestyles, spanning recreational dabblers, seasoned aficionados and medical patients alike. That’s why we’ve created a thoughtful and accessible space where cannabis consumers from all walks of life can come together without judgment or shame. With quality products and a warm and knowledgeable staff, we promise you won’t feel weird bringing your mom into our shop for her first legal dime bag. Tetra is a purveyor of quality cannabis products and accessories. 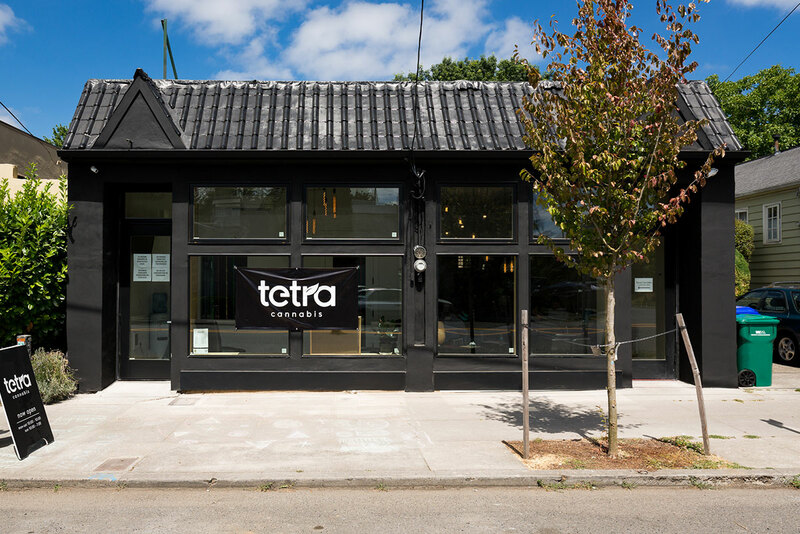 Located in Portland’s historic Belmont District, Tetra is licensed by the Oregon Liquor Control Commission (OLCC) to sell both recreational and medical cannabis in the state of Oregon. Card-holding members of the Oregon Medical Marijuana Program (OMMP) can shop at Tetra tax-free. This dispensary is cash-only, but there is an ATM on site for your convenience. Recreational customers must be 21+ to enter, while OMMP patients must be 18+.